The Inner West Tenant Group (IWTG) was formed as a result of grassroots community development Initiated by Rozelle Neighbourhood Centre. Susan Hawkeswood and Lisa Smajlov explain how it came about and what tenants working together are achieving. From 2008, Rozelle Neighbourhood Centre partnered with Housing NSW to deliver a monthly outreach program attended by 4-10 clients each month. The community setting allowed tenants to access non-housing related support. The outreach program ceased in 2010 when a weekly outreach program commenced at Leichhardt Centrelink. However, tenants continued to attend the Rozelle Neighbourhood Centre but it did not have the capacity to work one on one with social housing tenants. The Centre identified a need to bring tenants together to work collectively. In August 2011, public housing tenants were invited to attend an open forum. Now, drawn from public and community housing tenants, IWTG members are not just focused on maintenance but create opportunities for tenants to increase their individual and group capacity to be agents of change. Stakeholders from local organisations and government agencies are represented. During the past four years, representatives of Inner Sydney Regional Council for Social Development, St Vincent de Paul, Partners in Recovery, Leichhardt Municipal Council and the Local Member have regularly attended. IWTG responds to the demographic of the Leichhardt LGA where 1,105 tenants live in social housing. At 4.1% of the population, social housing tenants are hidden in the overall image of the Leichhardt area’s gentrification. Tenants are generally scattered across the area in small pockets, lacking connections with their more affluent immediate neighbours and are geographically disconnected from other social housing tenants throughout the LGA. People on low incomes in the Leichhardt LGA tend to have less support agencies and programs then neighbouring LGAs. Accessing grants is often difficult because the postcode boundaries of the area show a high average annual income in demographic studies. Social housing is a hub of inspiring and remarkable stories, collected in part thanks to IWTG. In 2013, tenants participated in Transform Your Turf, a series of creative art workshops held over 10 weeks. Together, tenants shared their experiences of living in “Housing”. Recognising the skills of tenants, facilitators were drawn from the social housing tenant community and worked beside multi-art practitioners and story-telling activists. Transform Your Turf aimed to smash stereotypes and shine a light in places most have never been. The resultant artworks by social housing residents were showcased in a travelling replica of a housing unit. In 2014, following on from feedback from Turf writing participants, IWTG received a Housing NSW grant for Write … Right Now! This creative writing project created opportunities for social housing tenants to learn new skills and build connections with other tenants. Blogging with Judy Singer, a local activist, local tenant and member of IWTG. Judy produced a blog – Diary of a Desperate Houso. She saw the workshops as an opportunity to be valued and to pass on her skills to other would be bloggers. Members of the Writing Working Party developed publication guidelines and a process for blogging. 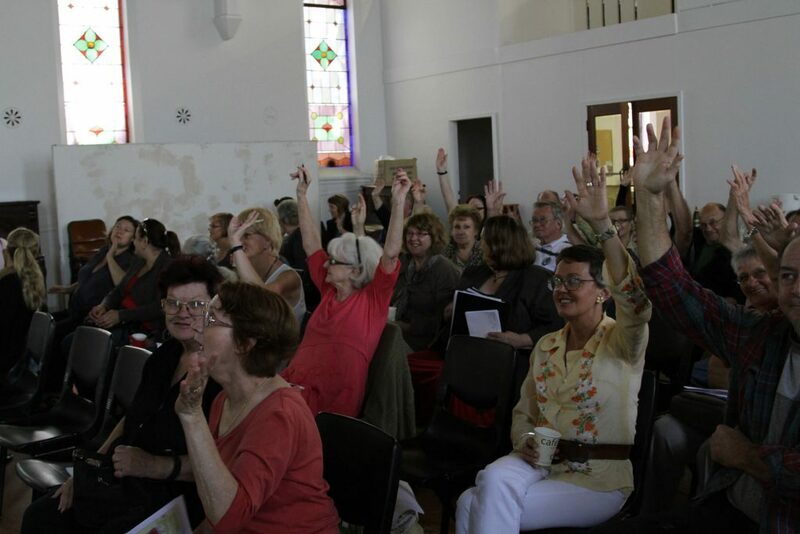 Writings were collected and the working party decided on the content for the first issue of our Social Housing Stories Newsletter, launched at Rozelle Neighbourhood Centre in June 2015. The newsletter was distributed by tenants throughout their local networks. The first Creative Catch Up session, held in 2015, was facilitated by the Chair of the Writing Working Party. Utilising some of the creative writing activities learnt at the writing workshops held last year and finding some new ones, participating tenants produced new writing for the second edition of the newsletter, to be published in December 2015. The editing and desktop publishing of this second issue will be completed by another IWTG member. This way, the skills of different tenants are continually evolving. IWTG is currently planning to talk with City of Sydney Council about expanding Social Housing Stories into their LGA. IWTG is also currently investigating funding for Speak Your Story. This project will give participating tenants the skills to interview tenants with the potential to work with a local journalist. Lack of confidence in writing was identified as a barrier to the participation of some tenants. Speak Your Story will give these tenants an opportunity to participate and broaden our Social Housing Stories. This will be an opportunity for IWTG to connect with tenants who are isolated and disengaged within the community. Inner West Tenant Group meets at Rozelle Neighbourhood Centre on the last Tuesday of each month at 11.30 am. All inner west social housing tenants are welcome. Susan Hawkeswood is the Community Development Worker and Lisa Smajlov is the Community Development Coordinator at Rozelle Neighbourhood Centre.